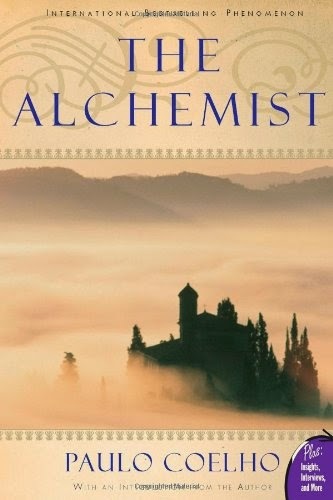 The Alchemist is one of those books that you’ll want to read before starting out on a new venture or a life-changing journey—or simply in those quiet treacherous moments when you start to doubt yourself and everything you set out to achieve. Now, this is not so much a story about an antiquated chemist who claims to have the power to turn lead into gold, but more about a shepherd boy in search of his Personal Legend (though I never said there wasn’t treasure involved). For whether you believe in God, omens, Universal energies, good vibes, or feng shui, Paulo Coelho assures us that “to realize one's destiny is a person's only obligation." So take a journey. But first, read this review. Santiago wasn’t always a shepherd boy, but he does seem to always have been a traveler at heart. And though he’s happy roaming the pastures of Andalusia with his loyal herd of sheep, a recurrent dream urges him to go to the Pyramids of Giza, where he’s destined to find treasure. But like many other people, Santiago is at first inclined to dismiss the silly dream, until a mysterious man who claims to be the King of Salem encourages him to listen to the omens in his life. And if there's one thing Santiago believes in, it's omens. Getting to the Pyramids proves harder even than Santiago could’ve imagined. So after polishing a Tangier man’s crystal, falling in love with a desert woman, and saving an oasis town from the threat of tribal warfare, Santiago's dreams become more complex. And that's when he meets the Alchemist. Just a forewarning: this isn’t a traditional narrative. When you’re reading The Alchemist, it feels less like fiction and more as though a wise old man is imparting you with the secrets of life. It’s a story of personal conquest and the things we learn along the way. But it’s not cheesy or preachy or even particularly revolutionary. Paulo Coelho simply reminds us that life is most interesting when there exists a possibility of a dream coming true. And more importantly, that the universe conspires to help us achieve those dreams. If we only just chose to listen to our hearts, we would learn that even we have the power to turn ourselves into the wind. P.S. It’s worth getting a copy with an introduction by the author, who outlines in detail the four biggest obstacles we face on our path to realize our own Personal Legends.